ME: UE category, RAT support, Frequency Band, Forbidden PLMNs/TAs/LAs, Barred Cells/Frequencies. The IMSI on the USIM will most likely be used to determine the HPLMN (Home Public Land Mobile Network) and will serve as the basis for PLMN selection. The UE selects the highest PLMN which is often its HPLMN stored in the USIM for the RAT supported by the ME. 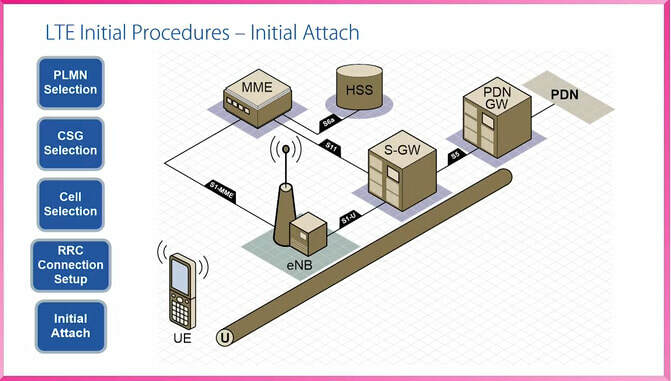 The UE will scan all RF channels in the E-UTRA bands according to its capabilities to find a suitable cell. On each carrier frequency, the UE need only search for the strongest cell. Once a suitable cell is found this cell is selected based on the band that the ME supports. This procedure requires stored information of carrier frequencies and optionally information on cell parameters from previously received measurement control information elements or from previously detected cells. Once the UE has found a suitable cell, the UE will select it. If no suitable cell is found, the Initial Cell Selection procedure will be started automatically. 1) The UE reads its parameters stored in the USIM, the ME's capabilities, and any stored information from prior network camping to initiate system selection. 2) The UE triggers system acquistion using the RRC protocol stack layer. The UE will always start with any stored information such as frequencies used in previous searches. If it is an initial search, RRC may request the physical layer to scan the entire band. 3) The physical layer uses the system selection sequences during acquisition (scan band/frequencies). The UE has obtained the frame information and is synchronized. 4) RRC requests the physical layer to read the Master Information Block and System Information Blocks (MIB/SIBs) as part of its schedule broadcast and control channel read. 5) The physical layer uses the SI-RNTI to read the MIB/SIB1. 6) Once SIB1 has been obtained, a number of checks are performed for suitable cell selection criteria such as MCC-MNC in PLMN fields, if cell is barred, if it's part of CSG cell, and if the cell belongs to a forbidden TA. If this is successful, PLMN selection is considered successful. 7) The UE uses the physical layer to read SIB2 and other SIBs. 8) The UE reads SIB2 and other SIBs broadcast in the cell. MIB/SIB1/SIB2 are required to camp on a cell. All SIBs are obtained by the UE. 9) The physical layer validates the criteria S, once successful -- the cell is selected and UE camps on the cell. As you can see, proper settings of these parameters will improve the RACH success rate especially at cell edge. Furthermore, the power_ramping_step is broadcast on SIB2 that determines the UE increase in RACH attempt if the eNodeB does not acknowledge up to preamble_trans_max setting, also in SIB2. Cell re-selection parameters are broadcast on SIB3-8 (see below). Note that this criteria is also consider during cell re-selection procedure. Qrxlevminoffset is only used when a UE evaluates a cell for cell selection as a result of a periodic earch for a higher priority PLMN from the PLMN currently camped. Qrxlevmin, Qrxlevminoffset, and Pmax are derived by the UE from SIB1 of the serving cell. This process is triggered based on measurement rules and ranking criteria. SIB1, SIB3, and SIB4 provide parameters that are considered during cell reselection and SIB3 contains measurement rule parameters. The UE must detect and measure neighbor cells when the serving cell's Srxlev is lower than a specific threshold. After measurements, the UE applies its ranking criteria and the highest ranked cell is selected during cell reselection. 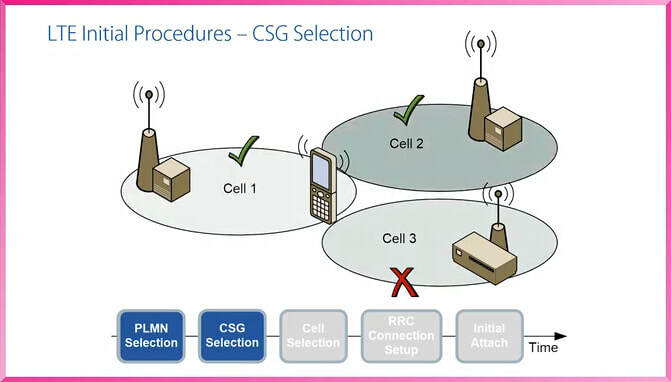 The new cell must be suitable and hysteresis is applied through Qhst and Qoffset before the new cell is selected. 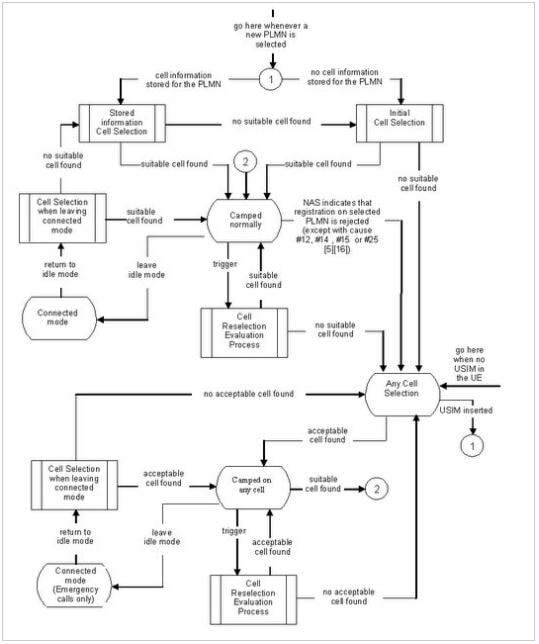 If the UE has evaluated in specific consecutive DRX cycles that the serving cell does not fulfill the cell selection criteria S, the UE shall initiate measurements of all neighbor cells, regardless of measurement rules currently limiting UE measurement activities. If a UE in RRC_IDLE state searches for 10seconds ithout finding new suitable cell based on searches and measurements using the intra-frequency, inter-frequency, and inter-RAT information indicated in the system information, the UE is considered to be out of service area. 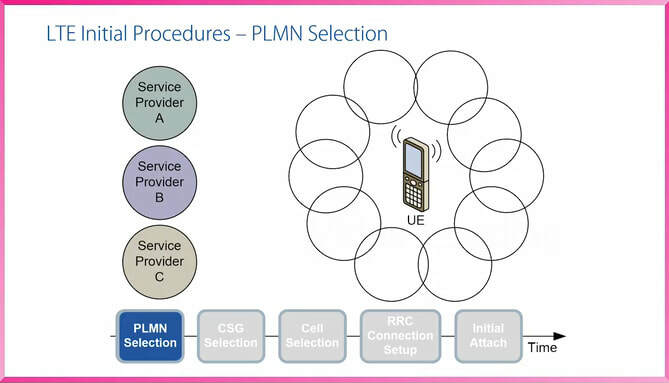 If coverage is lost on the registered PLMN, either a PLMN is selected automatically or an indication of which PLMNs are available is displayed. So inter-frequency searches will be triggered when Sservingcell <= 20dB (Q-Hyst * s-Intrasearch = 2*10=20) and non intra-frequency searches will be triggered when Sservingcell <= 16dB (2*8 = 16) for equal or lower priority systems.